From curtain… to Louisa coat! I think you know by now that I like to combine handmade clothes with 2nd hand stuff. But more often, I’m starting to use thrifted fabrics for my creations. In my first Louisa coat, I used a thrifted lining fabric and this project is an old curtain. I bought this curtain months ago on the flea market in Brussels (Vossenplein) for only 2 euro! Only on the first of September I decided that it would be a Louisa coat. My dear testers helped me make this decision! Thanks ladies. Now that I see your test versions (behind the scenes), I’m sure we made the right choice. So I have a little bit of time left to write something about the construction of my coat. Actually it’s a really easy coat to sew. Only a bit more difficult for me to draft! 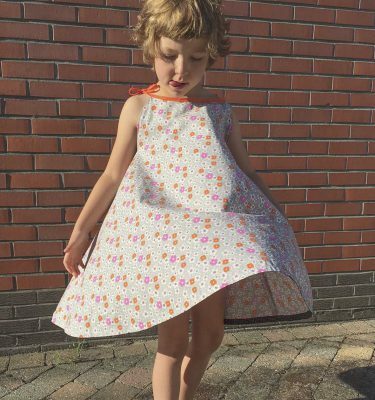 If you can sew the Louisa dress, you can make this one too. It only takes some more time… The lining coat is super easy. And assembling both parts can be done with a button placket or a zipper in between. Personally I prefer the zipper option, but maybe that’s because my girls are still rather small? But it doesn’t even matter what you prefer, because both options are included. I tried to make the pattern in this way that with only 1 extra pattern piece, both solutions are possible. And guess what: if you can sew a blind zipper, this one is a piece of cake! You only need a zipper sewing foot and the right technique. That I will show you in my detailed tutorials. Obviously! For the hem I don’t like it being topstitched, so I used this technique that I love. I made 3 coats / vests last year to prepare for this pattern and it really helped me a lot. Technically I knew very well what I wanted and what I didn’t want! The collar and hood options were obvious, but the new lines at the back made me add the tulip one too. And you will get a nice extra pattern piece for a finishing touch when the pattern is being launched. And no, I’m not talking about the flower. You’ll see! And in case you were wondering what Nore is holding in her hands during the shoot: a frog! That she had caught herself! Geel en roze vind ik een prachtige combinatie, dus geen wonder dat ik fan ben van deze Louisa! Beautiful coat! Can’t wait for the pattern release. Dat oude gordijn kreeg een topbestemming, zo mooi!! Mooi! Ik tel af tot de release! Welk patroon gebruikte je voor het jurkje? Want ook dat is supermooi! Hoe mooi beide andere jassen ook zijn, deze straalt voor mij Compagnie M uit ;). Prachtig! Zeer mooi! Die kleuren spreken voor zich! Can’t wait… I did not want to sew a coat this winter, but I think, I will have to try this one!